The Central Coast is no stranger to the devastating effects of wildfires. This year alone, the Holiday Fire and Thomas Fire raged through Santa Barbara County and destroyed dozens of homes and other structures. The devastating debris flow in January left many without homes and claimed the lives of 23 of our neighbors. I want to hear from you about how we can prevent and prepare for these natural disasters moving forward, as well as share what I’m working on to help protect families on the Central Coast.Join me for my Town Hall on efforts to mitigate the impacts of drought and wildfires this Monday, July 30th from 5:30 – 7:00 PM at the Natural History Museum in Santa Barbara.RSVP HERE, the event is free and open to the public. I’ve invited guests, including directors from the Los Padres National Forest firefighting service as well as Santa Barbara County fire and water department officials, to help answer your questions and hear your thoughts on the best ways to create a more prepared and resilient Central Coast. Given the devastating impact that these wildfires can have, it’s important that we have a plan and adequate resources for when wildfires start. 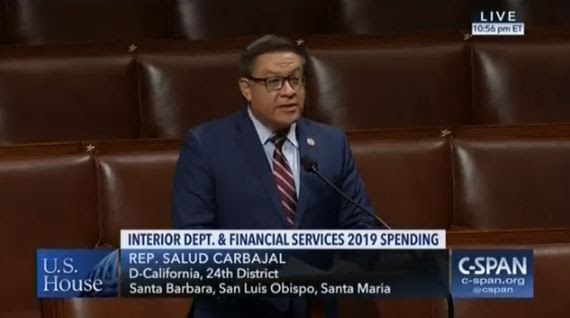 Last week, I offered an amendment to increase funds for the Forest Service’s hazardous fuels management activities by $10 million dollars, to help the Forest Service mitigate the threats of excessive fire fuels with proven and effective preparedness measures. That’s why I also, along with the majority of my colleagues, voted to pass the Disaster Recovery Reform Act (DRRA). The DRRA ensures that a portion of FEMA assistance funding is invested in pre-disaster hazard mitigation efforts. As we continue to experience devastating disasters such as wild fires and debris flows, we must find ways to adapt to these increasingly extreme weather patterns. Despite some of the heavy rains we’ve experienced this past winter, much of Santa Barbara and San Luis Obispo remain in “severe drought” conditions. That’s why I joined Rep. Tom Reed (R-NY) to introduce the Water Infrastructure Resilience and Sustainability Act (WIRSA). 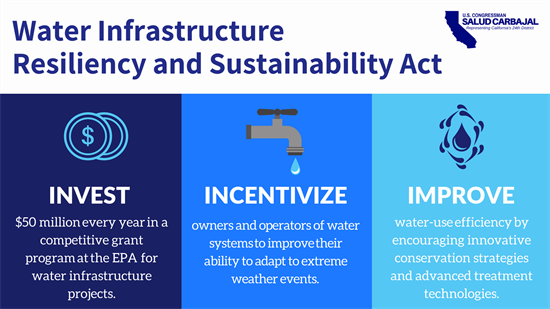 WIRSA would establish an EPA grant program for communities working with a local agency to improve the resilience and adaptability of their water infrastructure. Read more here. I look forward to hearing from you about how we can keep our community safe and prepared for future natural disasters.